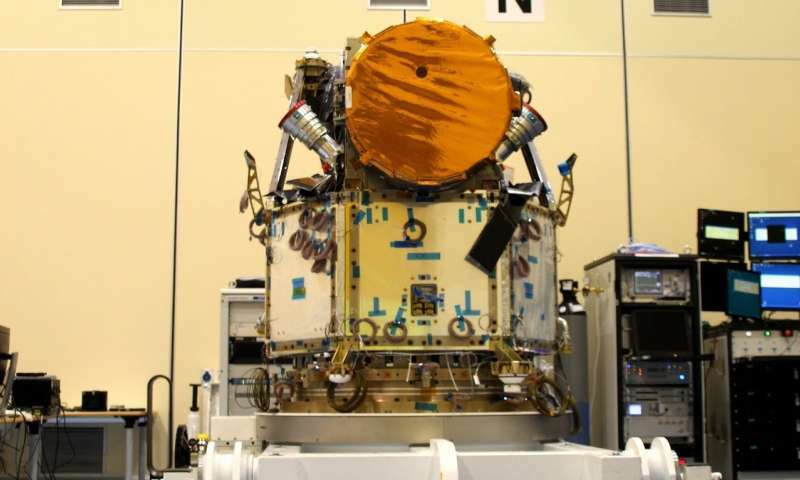 The Cheops satellite in the cleanroom of Airbus Defence and Space Spain in Madrid. Cheops, the Characterising Exoplanet Satellite, will make observations of exoplanet-hosting stars to measure small changes in their brightness due to the transit of a planet across the star's disc. The information will enable precise measurements of the sizes of the orbiting planets, in particular in the Earth-to-Neptune mass range: combined with measurements of the planet masses, this will provide an estimate of their mean density – a first step to characterising planets outside our Solar System. In this view, the science instrument – which includes the telescope, its aperture covered by a copper-coloured lid – is integrated on top of the spacecraft platform, before the installation of the solar panels. Recently shipped to France, the satellite will later travel to Switzerland and then to ESA's technical centre in the Netherlands for further tests. Finally, it will return to Spain, before shipment to Europe's Spaceport in Kourou, French Guiana. Cheops, which is implemented as a partnership between ESA and Switzerland, is on track to be ready for launch by the end of the year. It is an exciting period for the Cheops team as they scrutinise every detail of the mission with the spacecraft moving from country to country, and from test to test.